While America’s growing population of seniors may prove a burden when it comes to the federal government’s having to pay rising Social Security and Medicare bills, they represent an increasingly important market for businesses. Within King County’s population of 2 million, an estimated 232,000 people — 11.6 percent of the county’s populace — are 65 or older. According to the U.S. Census Bureau, that number will more than double, to nearly 500,000, by 2050. The number of those 85 and older will increase fourfold. Since the elderly also hold a large share of the nation’s wealth, it’s hardly surprising that new businesses are popping up to serve this burgeoning market. Among the most promising sectors are wellness and home-care services, fitness equipment and services, travel, medical self-help, insurance and investment management. Perhaps the most prominent sector to ride the wave is senior housing. 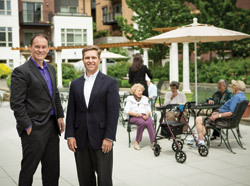 Companies like Aegis Living and One Eighty are building retirement communities, independent living complexes and assisted living centers with the latest five-star amenities such as coffee bars, high-speed broadband and entertainment and travel options. Many of the city’s luxury high-rise condos are being bought up by retirees who have sold off their large homes with their burdensome requirements to enjoy city life. Businesses and nonprofits, hospitals and care centers, senior service providers, pension planners, money managers and even home remodelers are all looking for new products and creative solutions addressing the needs of an aging population. Here are four other companies that have found a way to tap into the burgeoning market. From the Heart. Stella Ogiale, owner of Chesterfield Services. Description: Home health care, companionship provider and pharmacy. Headquarters: 1810 East Yesler Way, Seattle. Stella Ogiale’s home health care business grew out of her personal experience as the mother of an autistic child. A stay-at-home mother, Ogiale had her caregiver skills down pat by the time an older daughter encouraged her to find employment in the field. After some reluctance, Ogiale said “yes” to what became her life’s passion. 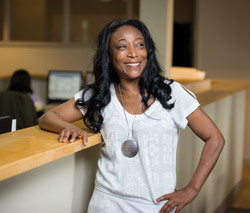 Since 1996 she has built her business, Chesterfield Services Inc., into a licensed statewide agency with more than a thousand employees providing care to people “at many different stages of life and facing different challenges.” The Seattle-based firm operates 14 offices and a pharmacy in locations across the state, from Spokane to Longview to Walla Walla. Chesterfield mainly operates through government-funded programs such as the Community Options Program Entry System (COPES), which offers personal care and home health services to people who choose to remain in their homes rather than move to a nursing home, as well as Medicaid. The company also welcomes private-pay clients. Its core services are long-term care of the frail and aged, those with debilitating conditions such as diabetes and stroke and those who are developmentally disabled. Chesterfield screens and contracts with caregivers such as registered nurses, licensed practical nurses and certified nurses as well as personal care aides and registered nursing assistants. Description: Ensocare sells software that helps hospital patients transition to outside care and improves hospital patient-management efficiency. Growth outlook: Revenue will double in 2014. Full Circle. Ensocare founder Ted Tanase. Ted Tanase launched his company in Seattle in 1999 with the idea that he would help families more efficiently find care for loved ones leaving a hospital. While service to patients remains his company’s core mission, the primary product today is software sold on contract to hospitals to accelerate patient transitions into follow-up care. Ensocare is operating in 130 hospitals throughout the United States. Its software allows hospital-based social workers to move people into a skilled nursing center or other care facility more efficiently, and then continue to follow that patient in recovery and/or re-hab. Ensocare’s match-up and discharge process can be as detailed as whether the patient wants kosher food or has a pet, whether the care facility has a game room with a pool table or provides transportation for medical reasons. Ensocare continues to operate a software development office in Seattle. Corporate business offices and a call center are in Omaha, Nebraska, where parent company CQuence Health Group is based. While the primary focus has been on seniors, the company’s software can be tailored to match patients of any age with care facilities, Tanase notes. Its latest expansion is with children’s hospitals, where pediatric patients may have received care far from home. Description: Offers free assistance to seniors and their families in finding in-home care or new housing based on needs and budget. Care providers pay a fee to join the vetted roster of A Place for Mom. Ownership: Privately owned by Warburg Pincus, New York. Growth outlook: In 2014, the company will have served 1 million families since its inception and expects to cross the 2 million mark in the next two to three years. Helping Hand. This year, A Place for Mom will serve its one millionth family. A Place for Mom offers free consulting services in most U.S. urban centers to those seeking senior housing. The average client is a 57-year-old daughter of an aging parent. The parent may need help to either remain in his or her home or move to independent or assisted living or some other kind of care facility. The company got a boost last year when it signed Joan Lunden, book author and former TV journalist, as its official spokesperson. Lunden shares her own experience of trying to find the right senior care option for her mother. A Place for Mom generates revenue from fees charged to care centers and providers that are included in its membership referral roster. 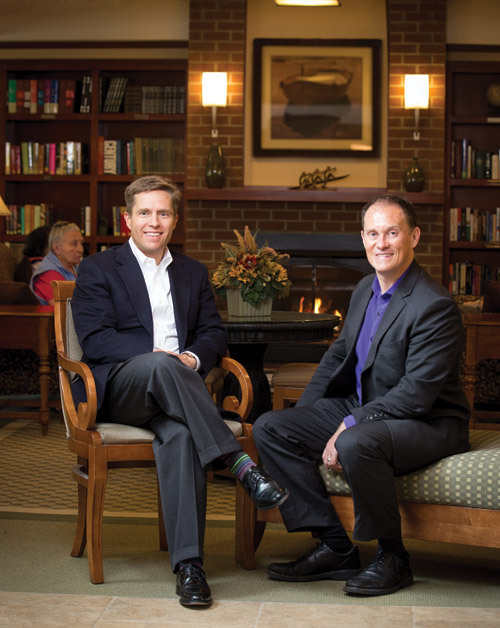 Nevraumont says three developments are producing substantial growth for the company: an aging population, the increasing sophistication of clients who may start a search sooner using the internet to find help, and a strong marketing plan. A Place for Mom advisers who field calls from families seeking help are salaried and live in the markets they serve. Their job is to survey clients using a lengthy questionnaire and then refer them to one or more providers that fit their preferences, care needs and budget. Description: A national franchise company providing non-medical in-home care services. Growth outlook: Ranked 86th among fastest-growing U.S. franchises in 2013 by Entrepreneur magazine. Ray Fitzgibbon has been a Synergy HomeCare franchise operator in the Seattle area for four years and likes the involvement with clients and staff. Synergy HomeCare is a franchise business that provides non-medical in-home care primarily to seniors who want to remain in their homes. The company also serves clients with chronic debilitating illnesses and those recovering from accidents. Fitzgibbon employs 60 full- and part-time workers, all certified nursing assistants, which, he says, makes it easier to assign people to a variety of clients. So far, there are five Synergy franchise territories in the Seattle-King County area, with each area roughly serving 25,000 people 65 and older, Fitzgibbon says. Franchise startup costs include a $45,000 franchise fee, plus other costs ranging up to $156,000. The parent company takes a 5 percent royalty fee from ongoing revenue to support corporate training and marketing. It requires that franchises be owner operated. The cost of Synergy services ranges from $32 for a one-hour home care visit, which may include light housework or helping someone with a bath, to $12.50 per hour for an around-the-clock live-in caregiver. While many industries serving the elderly are thriving, nursing homes, where people often go for hospital-like care after a debilitating stroke or hip fracture, face serious challenges. Many are operating either at a loss or with very thin profit margins, reports the Washington Health Care Association. The culprit is a low reimbursement rate administered by the state for low-income Medicaid patients. According to WHCA, which represents 400 nursing homes and assisted-living centers statewide, nursing facilities are losing $33 a day on every Medicaid patient they take in. “This financial gap is creating demands on the system that can be unsustainable,” says WHCA Executive Director Robin Dale. Meanwhile, in-home care is becoming a bigger factor in the senior housing market mix. In-home care businesses are among the fastest growing in the country. By 2020, these service providers are expected to create 1.3 million new jobs — a 70 percent increase. 1. An affordable senior housing crisis is under way. 2. Government funding policies will change. 3. Skilled nursing centers will evolve and no longer be a final resting place. 4. Many seniors will outlive their assets. Longevity becomes America’s fiscal enemy. 5. Internet services may offer electronic senior care monitoring. 6. Backyard “Granny PODS” may become a senior housing alternative. 7. Downtown urban senior living is a middle-class myth because of high costs. 8. Senior care services will continue to diversify based on need and affordability. 9. Senior housing providers will go after higher-income customers. That will help hold down overall rising care center costs. 10. Senior care services will face more state regulations related to background checks, resident safety and training. Costs will be passed on to seniors (or their children).